ALEX FERGUSON HAS criticised Newcastle manager Alan Pardew for his claims that the Manchester United manager should have been sent off after a verbal exchange with referee Mike Dean during their clash on Wednesday. The United manager called Dean over just before the beginning of the second-half of the 4-3 encounter at Old Trafford to argue over a decision in the opening period and he also had words with an assistant referee and fourth official Neil Swarbrick. Ferguson was unhappy that Dean overruled his assistant referee, Jake Collin, who flagged Papiss Cisse offside when Jonny Evans turned in an own goal and the goal was given. The Reds manager was criticised in the media for his outburst but because Dean has opted not to include the incident in his referee’s report means Ferguson will escape any punishment from the Football Association. 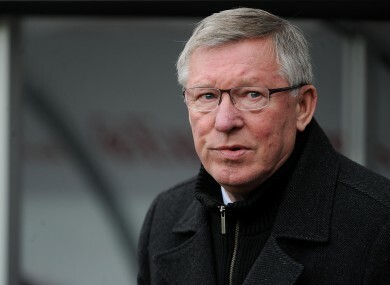 Pardew claimed today that Ferguson should have been sent to the stands but the United manager responded angrily on Friday. Ferguson also joked that the only man who has not been asked for his opinion is American president Barack Obama but his defence was serious. He said: “The problem for me and Manchester United is that the profile of the club is huge. Alan Pardew has come out and criticised me. Alan Pardew is the worst at haranguing referees — his whole staff every game. He was at it for the whole game on Wednesday. “He shoves the linesman and laughs about it and he has to cheek to criticise me. It is unbelievable. He forgets the help I gave him by the way. The press have a good field day. They have addressed every possible angle, the only one they have not asked is Barack Obama – he is too busy. “It’s unfortunate that I carry that, because I’m the manager of the biggest club in the world. I’m not like Newcastle – a wee club in the North East. “That is the facts of life. I was demonstrative but I was not out of order. That has been overplayed by the press. You’ve all had a field day. Ferguson has also defended his actions of encroaching onto the pitch and stands by his assessment of the incident – but did not criticise Dean. “I thought the first hand was on Evans from Cisse. The rule book says if an opponent is interfering with defender then he is offside, it says it clearly in the rule book. The interpretation is from Mike Dean is that he was not interfering, I think he was. I think that is reasonable. I thought Mike Dean handled it well. He is an experienced referee, mature. “There was no ranting and raving from me. I was demonstrative but then I am always demonstrative – everyone knows that. I’m an emotional guy. Email “'I'm not like Newcastle - a wee club in the North East' -- Ferguson hits back at Pardew jibe”. Feedback on “'I'm not like Newcastle - a wee club in the North East' -- Ferguson hits back at Pardew jibe”.